We celebrated Virginia’s birthday last weekend, and I was hoping to have these done by then (it was good motivation). But, try as I might, I did not finish in time. Still, I say delivery within a week of one’s birthday counts. 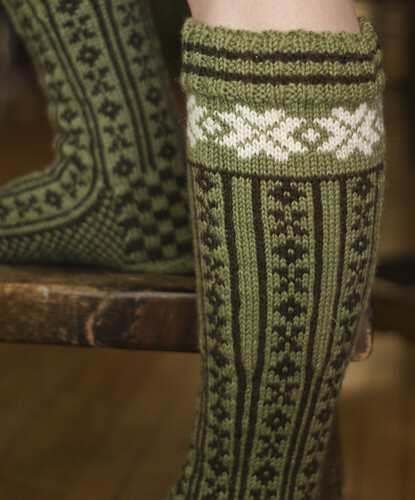 These are Nancy Bush’s Norwegian Stockings that I knit using Smart Yarn. The nice thing about DK-weight yarn is that it makes a project like this go much quicker. When I first cast these on, I was a little worried I’d be giving these to her for next year’s birthday. But, as you can see, they are done (and with only a couple of tiny errors). And, no birthday around here is complete without a last-of-the-season bouquet from the farmers market. With snow predicted for tonight and tomorrow, it appears like we just barely squeaked these in. 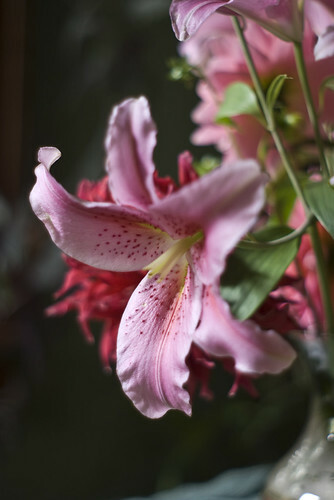 The socks are truly beautiful, and so are the lilies. Virginia is so lucky to have a romantic guy like you by her side. Beautiful…luv your colour choices. 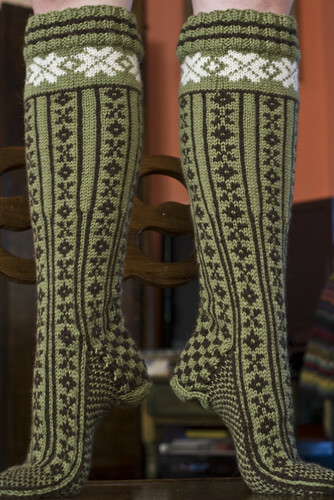 I made those same socks in handspun brown and white alpaca. Gorgeous! Wow, I want to make a pair, and I never wear knee socks. Definitely a great color choice as Jody said. Those are beautiful. Quite the celebration: the socks, the baking, the flowers. Wow, what stunning socks. I love them! The flowers are also gorgeous, I am sure your friends is going to be very pleased! Your blog (which I discovered yesterday) is awesome! Such a sweet gift! and being a few days late is not bad at all (I was a few months late earlier this year…) I am sure this was a very memorable bday for V. Like others have mentioned, I really like the colors you chose. They seem to fit her perfectly. happy birthday V! we had a birthday in our household too. 50. can you believe it? no hand knit socks for our boy, though. just a sack o’smartwools for cycling.